Grand Master Talbott was born in Dodge City, Kansas but raised along the eastern seaboard where his father worked quality control in the nuclear energy construction industry. After graduating High School in Newberry, SC, a minor diversion working in the Kansas oilfield, and completing his electronics degree in St. Augustine, FL, he returned to the Wichita, KS area in 1989, where he has lived ever since. Bob is a 25 year, perpetual life member of Albert Pike Lodge No. 303 where he presided as its 105th Master in 1999. He is a plural member of Hope No. 155 in Howard, KS, a dual member of Amity Lodge No. 87 in Newberry, SC, and a member of the Kansas Lodge of Research. He was commissioned a Grand Lecture in 2001 by M:.W:. 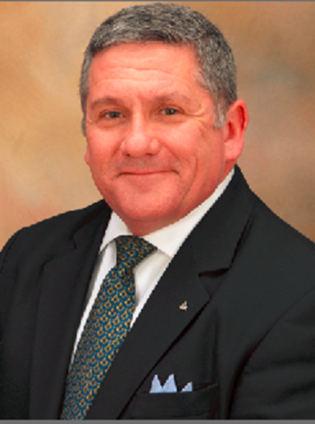 Mark Nelson and has served on numerous Grand Lodge committees. Other Grand Lodge service to the Craft include as Grand Orator (M:.W:. Glen Kohr), Grand Marshal (MW Tracy Bloom), and Grand Junior Deacon (M:.W:. Rick Reichert). He was appointed Grand Senior Deacon by M:.W:. Michael Halleran, in 2014 and successively elected to the office of Grand Master in 2017, to serve for the 2018-2019 year. Bob is a Senior DeMolay from Newberry, SC chapter, an endowed member of the Scottish Rite, SJ – Wichita Valley, and Noble of Midian Shrine Center. He has yet to join the York Rite bodies which should invoke the offer of many petitions, upon this reading. Daughter Shelbi and Grandson Luca (2yrs) are his life focal point, and he is blessed to have them live in the Wichita metro area. Among the many joys in his Masonic experiences are attending the raising of his Brother (Jeff Goertzen) and Cousin (Tony Talbott). Taking the degrees, being raised, and learning “the work” alongside his older brother (Merle Talbott) and the many years of serving in the officer line at Albert Pike No. 303 with him have laid up a treasure of happy reflections for many years. Having had the privilege of his Dad, Charles A. Talbott, planting the Masonic seed so many years ago and sitting in Lodge with him cannot be adequately described. Bob is a Portfolio – Delivery Manager for the PepsiCo companies where he delivers domestic and international Information Technology projects to support the business, for the last 24 years.